Donn Draeger once referred to Japanese martial arts as "plastic Zen". To really understand the Japanese martial ways (budo), says Draeger, one is required to appreciate Zen. 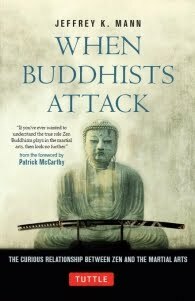 When Buddhists Attack: The Curious Relationship Between Zen and the Martial Arts is a study in the historical parallel between these two rigorous undertakings. The goal of Zen is an understanding of one's true nature called satori. This is known to happen in an instant, either through comtemplation of a koan, meditation, or even mortal combat. There's nothing like someone trying to lop your head off to put things into perspective. For the archetypal Zen Warrior, compassion and ahimsa (non-violence), hallmarks of Mahayana Buddhism, take a back seat to fighting skill, keen awareness, and a disregard for death. Author Jeffrey K. Mann, a longtime Goju-ryu karateka and accredited religious scholar (Ph.D), composes this work with authority and concision as he gives us a brief background on the life and teachings of the original Buddha (c.500 BCE) to the 28th patriarch, Bodhidharma, who arrived in China from his native India (or perhaps Iran) in the fifth century. Legend has it that when Bodhidharma brought the Buddhist gospel (Ch'an) to the Shaolin monastery he found the resident monks to be listless, so he devised a regimen of exercises to shock them out of their meditative stupor. These exercises eventually morphed into quan fa (unarmed self-defense). Ch'an Buddhism (Zen) and Shaolin quan fa began concurrently, though the credibility of these events and the very existence of Bodhidharma is cast in serious doubt by historians. Zen eventually found its way to Japanese culture from China in the thirteenth century. The heart of Zen is meditation. The classical Japanese warrior practiced a form of seated meditation called zazen to develop present-moment awareness and the various mind states that most practitioners of traditional martial arts are probably familiar with, such as mushin (no-mind), zanshin (remaining mind), and fudoshin (indomitable mind), which are covered at length in the book. Dr. Mann points out that the majority of samurai, Japanese soldiers and budoka were not strict adherents of Zen, nor was Zen the only spiritual practice that influenced budo. Furthermore, the entanglement of Zen and the martial arts has been romanticized and exaggerated by pop culture and even academia. Still, the influence of Zen in the martial arts, both historically and in the present day, cannot be dismissed, nor should it be overstated. The book is a quick read at 208 pages. Sections include "Overcoming Self, Overcoming Others" and "Budō as Religion."